Are you a person who likes to relax with a refreshing and soothing cup of tea? If so, then there are many reasons to switch from your regular tea to oolong tea. As well as being a delicious drink, there are many benefits to drinking this tea. What are the health benefits of oolong tea? Find out in this article about oolong tea’s antioxidant and antibacterial properties which can help with weight loss, reduce stress, manage blood sugar levels, and maintain a healthy cardiovascular system. Oolong tea (sometimes called Wulong tea) is produced from the same plant that black tea and green tea are made from – the Camellia sinensis plant. However, it is produced in a slightly different way. Most tea leaves are produced through a process of oxidation whereby the leaves of the plant are softened and then gently rolled. This starts a chemical reaction in the leaves which releases flavonoids, lipids, and amino acids. To stop the oxidation process, the leaves are then heated. Black tea leaves are oxidized which gives the tea its characteristic deep brown color rich in tannins. On the other hand, green tea leaves aren’t oxidized at all. Oolong tea is somewhere in the middle. It is produced by semi-oxidizing the tea leaves, resulting in a different chemical structure from green tea (which has many health benefits), but not as dark and bitter as black tea. So, by drinking oolong tea, you get the best of both worlds. One of the main differences between oolong tea, black tea, and green tea is the amount of L-theanine that it contains. L-theanine is an amino acid which is only found in the Camellia Sinensis plant and the Boletus badius mushroom. Oolong tea can have up to as much as 9.2 percent of its dry weight from L-theanine. All types of teas are rich in antioxidants and provide many health benefits. However, the way that oolong tea is processed means that its health benefits are greatly enhanced. Let’s have a look at the many health benefits of oolong tea. For centuries, Traditional Chinese Medicine (TCM) has used oolong tea to help people lose weight. There is more than just anecdotal evidence that oolong tea can actually help with weight loss. Over a period of 6 weeks, over 100 obese people took 8 g of oolong tea daily. At the end of the study over 3/4 of participants had lost more than 1 kg of weight, and some more than 3 kg. There was also a notable decrease in cholesterol levels. It was concluded that oolong tea could decrease body fat content and reduce body weight by improving lipid metabolism. It was also concluded that continued consumption of oolong tea may prevent obesity. The participants were given water, full-strength oolong tea, half-strength oolong tea, or water with caffeine, equivalent to amount in the full-strength tea. They had to consume one glass 5 times a day. It was found that metabolic rate and fat oxidation in those who had the full-strength oolong tea was significantly higher than the other drinks. It seems that the catechins and polyphenols (both of which are antioxidants) along with caffeine4 in oolong tea help the body metabolize fat better and more efficiently. Further reading: There are other natural ingredients that can help you lose weight, such as apple cider vinegar, coconut oil, honey and cinnamon drink, cumin, ginger and lemons. If you suffer from eczema or atopic dermatitis, you could boost your treatment by drinking 3 cups of oolong tea daily. This can be especially useful if the dermatitis is not responding well to topical treatments. The antioxidant properties of oolong tea can help to heal the skin from within. Further reading: If you suffer from eczema, you can try other natural remedies for eczema such as coconut oil, a special diet, these essential oils, and other natural treatments. The combination of antioxidant polyphenols and caffeine in oolong tea also help to control blood sugar levels. Drinking oolong tea can be an effective way to manage type 2 diabetes. In the study, the participants continued taking their regular diabetes medication and one group of participants consumed water regularly and the other consumed strong oolong tea 5 times a day. It was found that after one month the blood sugar levels in the participants who had the oolong tea significantly decreased. Further reading: You can also control type 2 diabetes with these foods and spices, apple cider vinegar, or a special diet. Tea, in general, is known to help reduce the risk of developing certain cancers.7 This is due to the high amount of antioxidants in tea which help to kill off free radicals in the body. Further reading: You can also use chamomile tea to switch off cancer cells, grape seed extract, and ginger root. Tea is well-known for its relaxing properties. There is nothing like a cup of tea to calm the nerves and help the mind relax. The reason for this seems to be the amino acid L-theanine, and oolong tea contains a high amount of this. L-theanine helps the mind relax without making a person feel sleepy and it is required for dopamine production in the body. Also L-theanine reduces the stimulating effect of caffeine. Therefore, oolong tea can help relieve your stress. So, a cup of delicious oolong tea can help you feel more relaxed and help you reduce your stress levels. Further reading: See how stress affects your body, and how you can reduce it with natural remedies or essential oils. Further reading: 80% of heart attacks could be avoided by doing these 5 easy things. The antioxidant properties of oolong tea can also help strengthen bone density, thus reducing the risk of developing osteoporosis. Further reading: Discover the 4 steps to prevent osteoporosis. Extracts of oolong tea have also found to contain properties which can promote good oral hygiene. One study compared the effects of rinsing before and after meals with an oolong tea extract and rinsing with just 0.2% ethanol. Researchers found that there was a significant decrease in dental plaque when oolong tea extract was used as the mouthwash. This is because oolong tea also contains antibacterial properties which are specifically effective against Streptococcus mutans, a bacterium mainly found in the mouth. Further reading: How to remove plaque naturally, and how oil pulling can whiten your teeth & improve your gums. It is very easy to enjoy all the health benefits of oolong tea. You can buy a ready-made oolong tea bags, or you can prepare it using loose oolong leaf (like this one). Because loose oolong tea comes in different leaf shapes, it’s hard to choose one-size-fits-all method for preparing the tea, but as a general guideline for each cup or 6 oz (180 ml) water use 1-2 tsp if the tea is rolled into balls and up to 2 tablespoons if it comes as whole or broken leaves. Heat the water to 185–205ºF (85–96ºC) which is the ideal temperature for brewing oolong tea without breaking down its aromatic substances. Steep it for two to five minutes, depending on how concentrated you want your tea. It is recommended to keep the lid on so that the medicinal properties are kept in the tea. One concern that some people have is about the amount of caffeine in oolong tea. One cup of oolong tea contains between 50-75 mg of caffeine. This is slightly more than green tea and slightly less than black tea. One of the precautions of consuming large amounts of oolong tea is due to its caffeine content. Caffeine can affect people in different ways, but drinking more than 5 cups of oolong tea a day can cause a person to feel the effects of too much caffeine. These side effects could be headaches, sleep problems, and nervousness. People with high blood pressure should also be careful about the amount of caffeine they consume. However, this doesn’t seem to happen in people who don’t have high blood pressure and regularly drink oolong tea. Drinking too much oolong tea can also cause calcium to be flushed out of the body. Therefore, if you have osteoporosis, it is best not to drink more than 3 cups per day. According to WebMD, oolong tea in small amounts is probably not harmful for pregnant women or women who breastfeed, and it is recommended not to drink more than 2 cups a day of oolong tea. 1. Beneficial effects of oolong tea on obese subjects. 2. Oolong tea reduces visceral fat. 3. Oolong tea increases metabolic rate and fat oxidation in men. 4. Green tea catechins, caffeine and body-weight regulation. 5. Oolong tea in the management of recalcitrant atopic dermatitis. 6. Antihyperglycemic effect of oolong tea in type 2 diabetes. 8. Tea consumption reduces ovarian cancer risk. 9. Beneficial effects of tea against prostate cancer. 10. 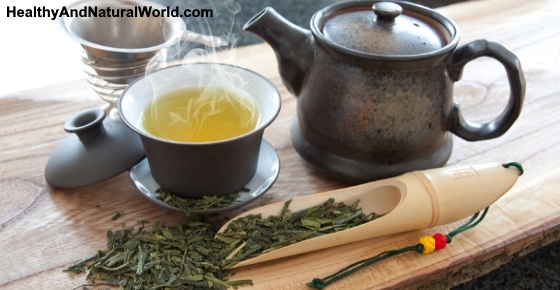 Green tea and prevention of esophageal and lung cancers. 11. Oolong tea extract induces apoptosis in human stomach cancer cells. 12. L-theanine and its effect on mental state. 13. Antioxidative activities of oolong tea. 14. Biological and Pharmaceutical Bulletin. 15. Oolong tea in patients with coronary artery disease. 16. Oolong tea consumption and risk of mortality from cardiovascular disease. 17. Evidence of increased bone mineral density in habitual tea drinkers. 18. Oolong tea to prevent bone loss.